Local guides with insider tips about everything. Local paths, main attractions in and little away from the city center. Global view of the city. Big final, great for socializing: do as the locals do and drink something with us on blanket in Tivoli Park. These General Conditions apply for applications for “Bike Tours”. Bike Tours are organized by Vandrovc-Globetrotter Tour Operator (“Turistična Agencija Vandrovc, Primož Kadunc s.p. Gradiške Laze 33, 1275 Šmartno pri Litiji” in Slovene, in following text “TA Vandrovc-Globetrotter”). General Conditions regulate relations between traveler, who apply for Bike Tour and TA Vandrovc-Globetrotter. If any of relations or questions is not specifically terminated in these General Conditions, then special conditions, written in a specific program of the tour, that a person applies for are valid. A person can apply for Bike Tour by fulfilling the web application form available on our web page www.ljubljanabiketour.com, sending us an email, calling us on our mobile phone, visiting our office or at our partner’s offices (hostels, hotel, etc. where available). Every traveler, applying at our web page, by email or phone gets a confirmation by email or via Whatsapp/Viber. Travelers applying at our partner’s offices get a voucher which is valid as a confirmation of the application and should be given to our staff at the beginning of a specific tour. Applications are accepted at least one day before the start of the bike tour if not otherwise specified in a specific tour program. The application is valid immediately. Minimum number of travelers for any bike tour is two unless otherwise specified in a specific tour program. All services, included in the price of a specific tour program, are listed by the program on our webpage www.ljubljanabiketour.com. If not stated otherwise in a specific tour program, the price of the tour includes all of the services, written in a specific tour program and there are no necessary additional charges. 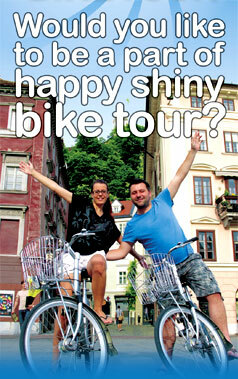 The price of a specific tour is available on our web page www.ljubljanabiketour.com. The prices are calculated per person if not stated othrwise. For applications via our web page, email or phone there is no advanced payment needed. Advanced payment is obligatory when applying for the tour at our partner’s offices. The height of the advanced payment depends on the partner and it can be from 10% - 100% of the total price. If the tour is cancelled by the traveler at any time he is not entitled to get any refund of the amount that was already paid for the tour. TA Vandrovc-Globetrotter can cancel the tour because of the unpredictable circumstances (for example severe weather situation) that would be a reason not to organize the tour if these circumstances would be known earlier. In this case a traveler gets the opportunity to change the date of the tour without any additional charges, or not to join the tour at all and gets back the full amount that was already paid. All the necessary information (date, time, meeting point…) is sent to a traveler by confirmation email or is written on the voucher (when applying at our partner’s offices). TA Vandrovc-Globetrotter is responsible for the realization and quality of the program. Any complaints about the quality of the tour should be told to the guide himself during the tour. If a situation could be solved on the spot and the traveler did not mention it to the tour guide, then TA Vandrovc-Globetrotter understands the traveler agreed with the situation. If the situation cannot be solved on the spot, the traveler has a chance to write a written complain to our address (Turistična Agencija Vandrovc, Primož Kadunc s.p. Gradiške Laze 33, 1275 Šmartno pri Litiji) up to 60 days after the tour is finished. If some of the services, written in a specific tour program, are not realized or are partly realized, a traveler gets the right of partial refund. The height of the refund is same as the actual price of the part of the tour that was not realized. Every person, who applies for Bike Tour rides a bike on his own risk and is responsible all for himself. TA Vandrovc-Globetrotter or tour guide do not take responsibility for any injuries during the tour. These General Conditions are a part of contract that is made between TA Vandrovc-Globetrotter and the traveler. All conflicts will be solved on agreement. If this is not possible then court in Ljubljana is competent.